Spiderman has been a regular character in popular culture for many years. He has been popular ever since his first appearance in the comic book “Amazing fantasy #15” in 1962. 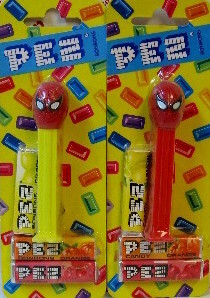 As a PEZ dispenser Spiderman been very popular, and has been released several times through the years. Below are the different Spiderman releases and known variations of the dispenser. Spiderman A was first released in 1978. The dispenser has been released both in cello and on card. This dispenser came on both a red and a yellow stem. The yellow version is hard to find. There are primarily two variations of Spiderman A. These are easy to tell apart. 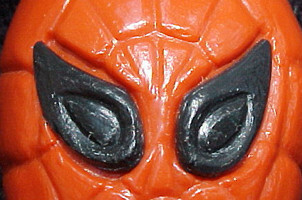 The most common variation has the spiderweb molded to his entire head, while the uncommon variation is missing the spiderweb on the back of his head. 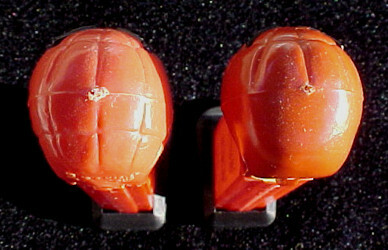 The version without the web on the back of the head is also cast in a slightly darker red color than the common version. 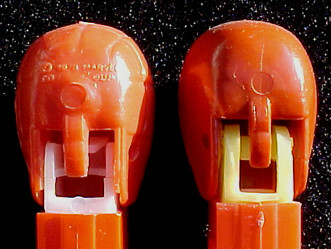 The common version is shown on the left, the uncommon version on the right. 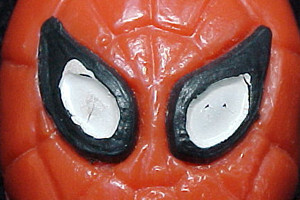 Another difference between the two versions is that the uncommon version does not have white paint on the eyes, while the common version normally has white paint. In 1991 there was a new release of the spiderman dispenser. 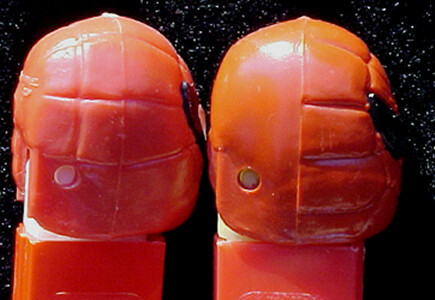 The character had a new design and a new mold. Spiderman B comes on both a common red stem and a harder to find yellow stem. In 2000 the third Spiderman was released. This time it came on both a red and a blue stem. Both stemcolors are common. Spiderman D was released in 2009. No known variations exist of this dispenser. In 2012 we got the latest release of Spiderman. It was released on both a blue and a red stem, but this time the character had a full torso instead of just a head. This entry was posted in Uncategorized and tagged PEZ, PezNorge, Spiderman, Vintage on January 1, 2018 by Ole.